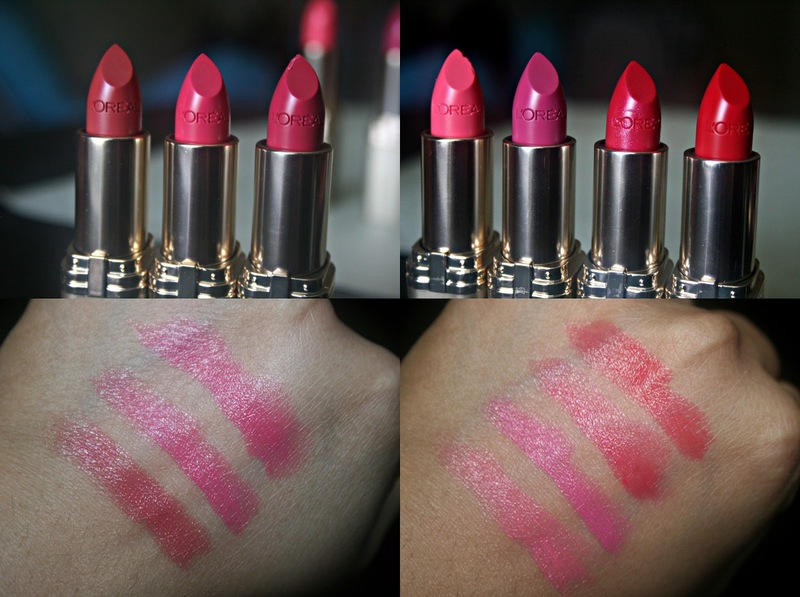 L'Oreal Paris Colour Riche Lipsticks ($8.95) - The Colour Riche Lipsticks are very creamy, moisturizing lipsticks with great color payoff. The color selection is nice - there are colors ranging from pale, pastel pinks to deep raspberry pinks. These lipsticks do have a strong scent which I'm not too fond of. Other than that, they are fabulous lipsticks for the price! L'Oreal Paris Color Riche Le Gloss ($7.95) - The Le Glosses from the Colour Me Pink collection are some very flattering pinks for my skintone. Its a sheer wash of color, but very moisturizing and glossy. Raspberry Flush especially is a gorgeous color for most medium/dark skin tones. These have a sweet caramel scent and flavour, unlike the lipsticks. No complaints formula wise either! L'Oreal Paris Color Riche Nail Color ($5.99) - I like the color selection of the nail colors L'Oreal puts out every time there is a limited edition collection. I loved the pastels from the Versailles Romance Collection and these are just as pretty. The formula is nice to work with, but they aren't too long wearing though - I wore Berry Jealous and it chipped the next day. All polishes except Pink Attitude are 3 coats! Overall, the colors are gorgeous - there's a pink for every skintone, whether you want a vivid pink or a sheer wash, you can be sure to find it here. Colour Me Pink is limited-edition and is available now! What are your thoughts on the L'Oreal Paris Colour Riche Color Me Pink Limited Edition Collection?